The Gentleman Crafter: Sharing The Love! The winter grass has taken over the back yard...Gotta mow that, I always cut back my roses on Valentine's Day...A big thorny task....Crepe Myrtles need to be trimmed...Mom's Birthday present to be finished...Have to try out the new Dylusions stamps...MUST pull out Tim's new Distress Paints....Oh and get a project ready for Tuesday! I CAN DO IT! Or at least that's what I'm telling myself! First, If you are around the area, come on down to the Gaylord Texas Hotel in Grapevine, Texas next weekend. It's the Scrapbook EXPO February 22 and 23rd. I will be demoing Dyan's new inks, stamps and stencils, as well some cool new Ranger products for the Crafty Scrapper in Waxahachie! It truly is going to be alot of fun! Come on down and please come give me a hug!! Also wanted to share some Fantastic tags that Shari had done over on her blog Shari's Creations With the Cricut. Go check them out and please give her some love! 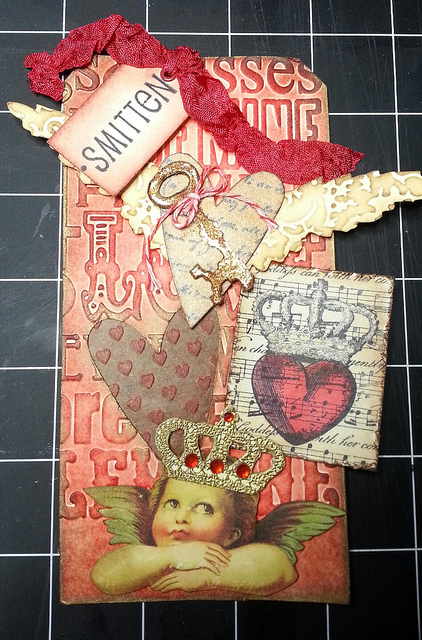 And...A HUGE Thank You LoriCtoo for the amazing Valentine tags you sent to me! I will love and cherish them forever! Please take a look at these beauties! Have an Awesome Saturday Y'all!! Hope to say "hello" next weekend! Yay Sarah! Come by and play! It's going to be FUN! Thank you, (with a hint of embarrassment) and you are very welcome Jim! Glad they made it in one piece. I am so honored to be featured on your blog. Wow, never expected that. Just was sending you some hugs for Val.Day. These are stunning Lori! Had to share! Thank You again! J.
Jim "YOU ROCK" !!! Your Art is the most amazing work I have seeen for long. So unique and just so much, the style I love - You are so talented and an oustanding Artist - I am so glad I found you - you are such an inspriration to me. Thanks Tons SanDee! so appreciate you! I'm glad you found the blog! The folks in the craft community are pretty amazing and I thank you! Jim, you are too sweet showing my tag on your blog. Thanks so much you made my day! 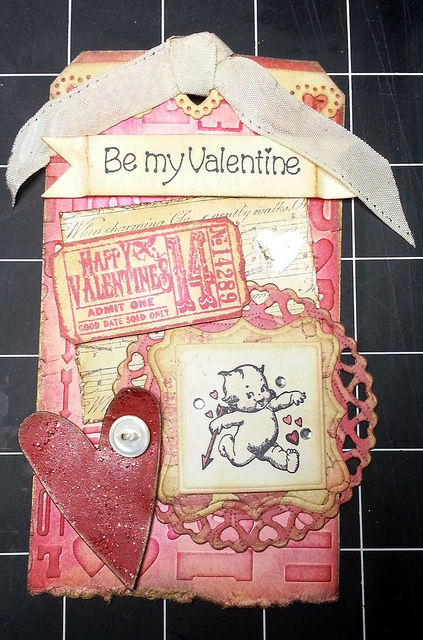 The Valentine's tags from Lori are awesome, love all the layering (good job Lori) I wish I were closer to Texas, I'd love to see you do your demo and join in on the retreat. I'd also love to be out doing yard work, it's 24 degrees here and snowing, hopefully summer will be here soon. I bet your Basset Hounds love playing with daddy in the yard. (You did say you had basset's didn't you?) I hope you find the time to get everything you want to done today. Don't stress about Tuesdays project, we'll watch you do whatever. Thank you Shari for the kind words. Jim, just checking in to see what you're up to for the weekend and of course you have a list a mile long. Don't envy you the yard work. Finish your Mum's gift - we can just chat on Tuesday. I would love to come see you but it's just a tad too far from Seattle. A virtual hug, anyway, demo-man. :) Shari and Lori - you made gorgeous tags and I loved seeing them. Off to my own chores now. Have a great weekend Jim. Thank you Mo, never expected to see my work on the internet! Thanks Mo for the nice compliment. Jim is such a sweetie for posting them on his blog. Awesome Tags! Love them all! I hope you get everything done that you have on your list! Congrats on getting to demo Dyan's and Tim's goodies! It is so much fun to do that! I just got checking my email and blogs... I had to work today! Have a fabulous rest of the weekend! just bopped in to see what was up with you. Gorgeous day to be out in the yard, but I don't envy your chores. I spent Wed and Thurs morning trying to clean mine. I have tons of prunning that will take several more weekends to accomplish and the help of hubby. Atleast I got a start. Still need to prune my roses. Hate that job and very glad when it is complete. I have been busy with several craft projects, that just needed to be done and shipped out Monday. So better get to it. Wished I lived closer cause I would love to drop in on you at the scrapexpo. Sounds like fun. Enjoy the rest of your weekend. Hope you get it all done. Happy Birthday to your dear Mom. She is such a cutie. Wish I could go to the Expo with you!!! I'd love to see you doing demos...please have Cesar do a little video for us poor people who can't come play. I hope you get a few things done on your "have to" list so you can play with your "want to " list!!! It's COLD here in Yankeland...and snowing...can I say I don't miss it. I think the high today here in Indy was 24 and the low is supposed to be 11!!!! I want my Texas weather!!!! Jim, thanks for sharing the wonderful tags by Shari and Lori. Wish I was closer. Would love to see you demo at the expo and the retreat sounds like a fun time. Any plans to come to California this year?. Hey, Jim...sounds like you have your work cut out for you this weekend. Not me. It's our 37th wedding anniversary, and I'm being a bum! It snowed here yesterday, and it was the perfect day to cuddle up and watch movies, pop corn and order in pizza. So that's what we did! Lori's tags are gorgeous....try not to work too hard this weekend. Wish I lived nearby so I could pop over to meet you in real life. Thank you everyone for you kind comments about my tags! It sure made my day/week when I saw them on the blog. Made me get back in the craft room and make more stuff too. The tags from LoriCtoo are just gorgeous. You do wonderful work, Lori. Jim, I will be in Dallas next weekend and hope to surprise you at the expo with a big hug! I just have to talk my daughter-in-law into going with me. Beautiful tags Jim! I'll definitely check out Shari's blog! Hey Jim! I'll be there too!!! I'll be driving you crazy!!! Will love to hang out again! Fab Valentine score here!!! So excited to have you join our crafty crazy group for the weekend!